For anyone who might think it a quick way to riches, you simply do not write wine books for financial gain. Most everyone writes these types of books with little regard to the scant paycheck because they’re passionate about a grape, a region, or a certain moment in time that all end up in a bottle which has somehow moved them to put words to paper. This is how I ended up with the Vinologue wine books which were kicked off by a love of Dalmatian wine that goes back over a decade now. And it’s the same reason that the Georgian wine guide came into being and was just released this month. My first trip to Georgia presented similar frustrations as trips to other wine producing regions. Where the hell were the wineries? Where should I eat? Any wine bars in this town? What and how do you even say, Rkatsiteli? And what on earth is “ქვევრი”? Georgia was one of the more impenetrable places I’ve been in terms of visiting for wine. While the people are colorful and engaging with food that’s even more so, the ancient production methods of kvevri (ქვევრი), and indeed the language and beautiful, yet incredibly foreign alphabet, there was a lot of head scratching. This was a place ripe for a guide to open up the wines and culture to everyone else. But, despite all the time spent in the country last year, Georgian words do not stick in my head and the book is as much for my own use as for everyone else. My self-serving need for a book is hopefully your gain as well. Being awarded the Geoffrey Roberts Award from the Worshipful Company of Vintners in London made a great wealth of this possible as the old, “hablo un poquito” an English speaker tries to pull when faced with a foreign language didn’t fly. I needed a translator and coordinator for visits to try and pack everything into the three months spent there on various trips. I found this in Tamuka Araviashvili who did a massive amount of legwork to get everything in place once I arrived as well as somehow not strangling me after being stuck together in a car for many weeks. So how does it work when researching a book like this? I think most people are of the idea that you’re just drinking wine all day and living the good life. While I’d love to project this image as much as possible (as well as hang out with people who do actually pull it off) the reality is that you’re an insane person as you visit four or more wineries every day. You’re also tasting wines at the same time and let me emphasize that’s tasting not drinking as you have to drive on Georgian roads for the next visit. Sometimes it’s more than four and one day, I think it was actually seven visits with an infamous supra at the end of it. This point of not drinking anything was received a touch oddly by the Georgians where the idea of spitting wine is just unheard of. I’m not a fan of it either as I absolutely love the substance, but it’s the only way to taste 20-30 wines in a day without striking someone’s wayward cow that’s ambled into the road–or worse. The scope of the book changed from initially being about just the eastern region of Kakheti to being one about all of Georgia. I ultimately visited over 100 wineries which forms that vast majority of those established and I tasted nearly 300 wines. Despite this aggressive schedule, it wasn’t enough. 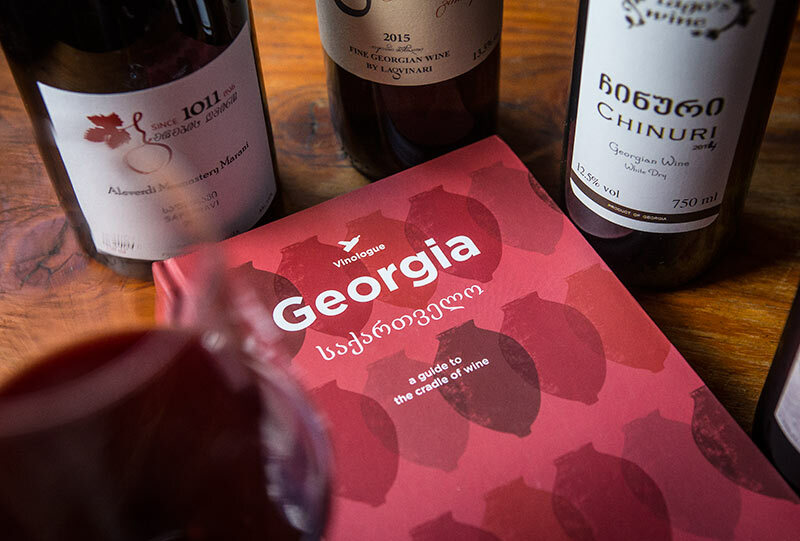 Both myself and my Editor in Chief, Elia weren’t convinced and while the wine segments were solid, Georgia is more than that as the food and history make the wines what they are as the winemaking itself. Elia came up with the idea of contacting Daria Kholodilina whose blog we’d made good use of in the first trip and ask her to come on as a co-author of the book. While originally from Ukraine, Daria is now a local, living in the capital, Tbilisi and comes at the country with a local’s viewpoint that has the great curiosity of someone who is always traveling. She’s a fountain of knowledge about the local scene which is exactly what we needed. Her text helped to flesh out some slightly flabby corners of the book, especially with the food, history, language (she speaks Georgian in addition to four other languages), and added in a bit more to some of the regions such as the West with Batumi which she’s a huge fan of. In addition to following her blog, you should check out her Instagram if you want some fun. And now she’s doing Georgian wine tours as a result. And through the winter we wrote, we edited, Daria checked out new places so that the book could be as current as possible and then we fixed the text to physical page. A local Spanish designer, Carol van Waart wrapped the book with a new look to match the shift to a hard bound and slightly larger format than previous books. Once all of that was done, it was off to the printer and a few weeks later (more than we’d preferred due to a strike with the shipping company) the book arrived and this year of labor to give everyone a point of entry to this wonderful and delicious corner of the world has arrived. And of course, now it can be yours!